As I said the inspiration came from the visit at a food festival. I tried plenty of interesting and tasty food. One of the items I had were spicy seasoned prawns, served on a bed of arugula and some freshly made aioli. The snack was heavenly and cooked to perfection. While I saw people walking around and eating their hamburger variations I felt inclined to merge the two dishes together. I am not fond of simply copying a recipe and making it my own. Plenty of thought went into this dish until I was convinced that it is sophisticated enough for you but also so easy to prepare that anyone could copy it. One of the most underrated and in my opinion highly important ingredients are the buns. I was looking for something out of the ordinary. At this point, I would opt for making them myself. As I don’t have a good functioning oven that isn’t a true option. After some research on- and offline I found vegetable burger buns from the brand “The 4 Bakers”. The ingredient list looked promising as there was a minimum amount of unnecessary ingredients. They have different versions of their buns, but the vegetables fitted my recipe idea perfectly. You can use any shrimp or prawn you like. I got cooked and peeled cocktail shrimp. I eat those regularly and new their taste. Besides that, they have the best size for what I aimed to use them for in my spicy shrimp burger. Shrimps are a very lean source of protein. Lean means that they don’t have much or any fat. 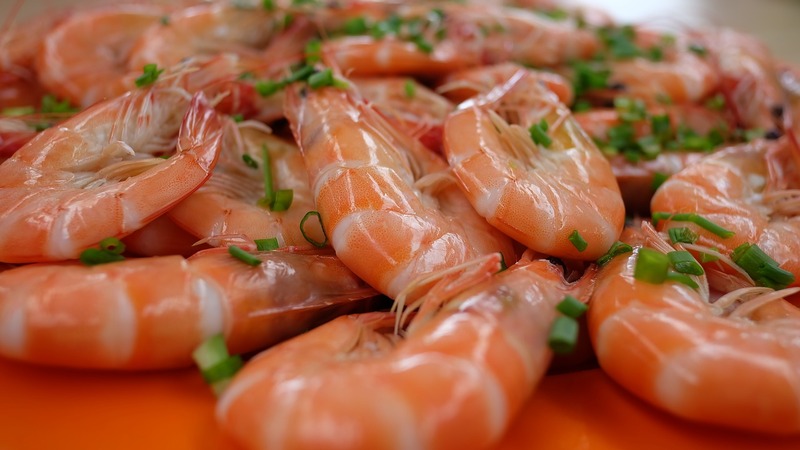 As shrimp are also low in carbohydrates they end up being very low in calories too. That being said, shrimp and prawns are high in minerals such as calcium, iodine, phosphorus and sodium. 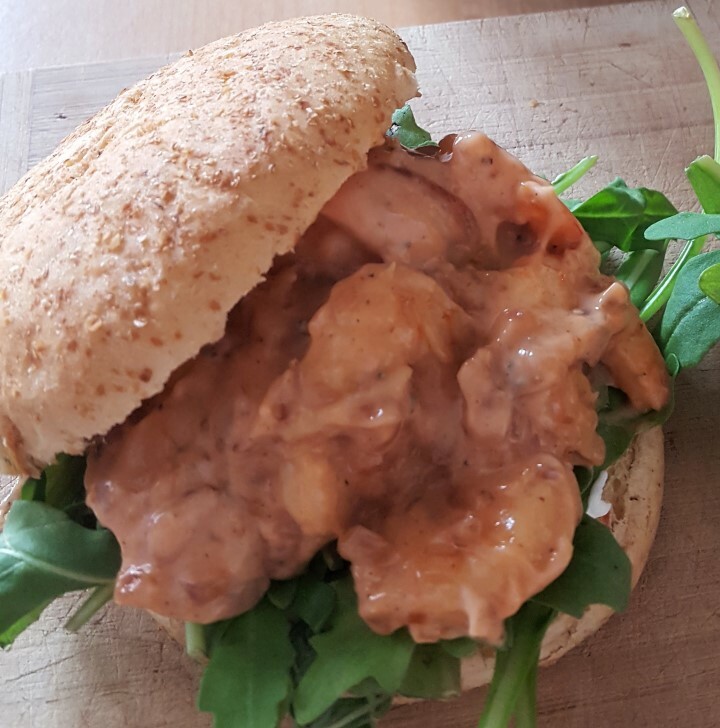 The sauce will make up for the leanness of the shrimp and give the burger their specific flavour profile. It is a hamburger cocktail sauce. The base is a light mayonnaise that I mix with some ketchup that is high in parts of tomatoes and low in sugars. This makes this sauce rather fruity and still not heavy. To get the most out of the flavour of the sauce and the shrimp you need to season the sauce with a good salt, some pepper and for a little twist add some cayenne pepper. The latter really makes a difference and elevates the dish. 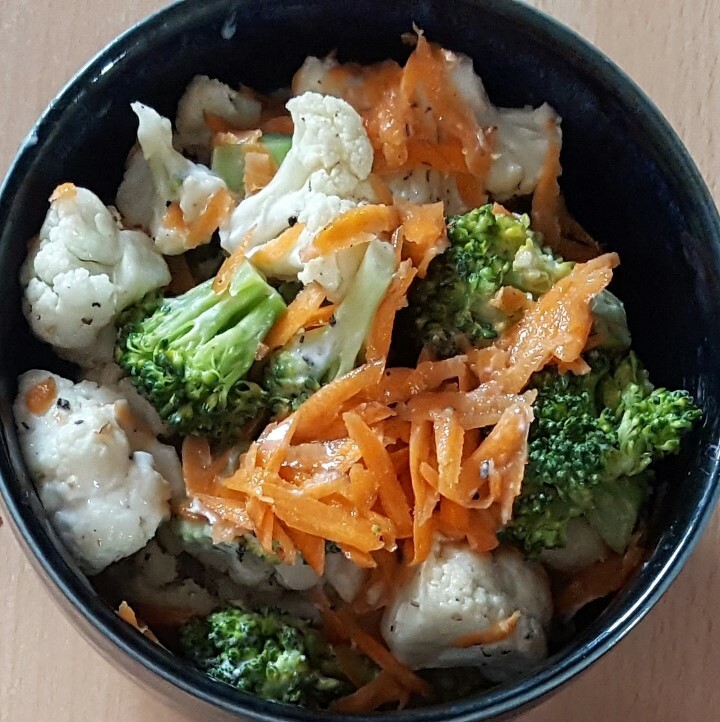 To make this recipe even healthier and more nutrient rich I chose to ditch the fries and make a bowl of vegetables instead. It’s a mixture of steamed broccoli and cauliflower with some raw shredded carrot in cream cheese. The complete dish is very well-rounded and works well after your workout. It contains a high enough amount of proteins to get your muscles some fuel, a good amount of carbohydrates to replenish your glycogen stores and some healthy fats from the shrimp and the olive oil in the mayonnaise. Fat isn’t a bad macro nutrient. As with everything you need to make sure that it comes from the right sources. Fat is also a good flavour enhancer and will make sure that you feel full for longer. Unlike carbohydrates and higher amounts of protein, fat doesn’t have an effect on your insulin and you, therefore, run a much lower risk of falling into a “food coma” known from too many carbs and protein. Keep in mind that low carb is a diet choice and needs to fit your lifestyle. Carbs are not bad by themselves. It’s as with fat. Make sure it’s coming from the right places, i.e. as little processed as possible especially the refined white sugar, in the right dosage and timing. Eating carbs after a muscle intense workout is usually a good idea as you need this macro nutrient to re-energize your body. This means in order to repair the damage from your workout you need glucose, as it’s the most convenient (read fast and efficient) way for our bodies to create energy. The protein will help to repair and grow new muscle tissue and the fat needs to replenish your stores of essential fatty acids. Those fats have an important role in your body. They are called essential as the body cannot produce them on their own. There are also essential amino acids. (EAA, read proteins). There are several sources of EFA. As I want only the best for you I added four sources of EFA: shrimp, olive oil, broccoli and arugula. As I said EAA are important too, especially if you are physically active, and the shrimp contain all the EAA our bodies can’t synthesize themselves. Here are more recipes with plenty of EAA and EFA. I might be biased but I loved this dish a lot. It tastes very well rounded and the sauce with the cayenne pepper gave the shrimp all the support they needed to shine. I hope you enjoyed this recipe. It was a lot of fun tweaking it until I was satisfied with the result and I’d like to hear your experience too. Share your thoughts, comments and feedback in the comments section or tag me on social media. I like to engage with you and continue this conversation online. Please feel free to share this recipe everywhere you feel like too. Word of mouth is the best way to grow and I appreciate your support. 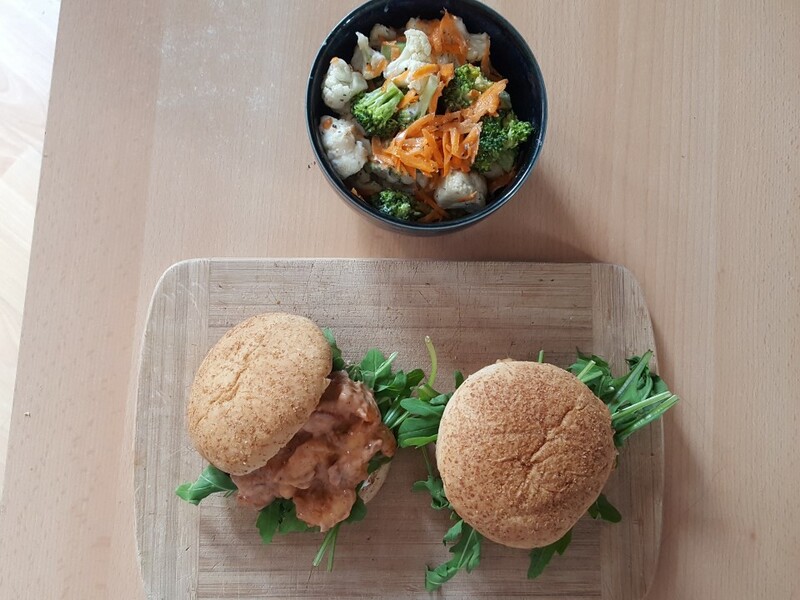 2 burger buns (I used vegetable buns from "The 4 Baker"
Clean the broccoli and the cauliflower. Cut into small pieces and steam in a steamer or pot. Shred the carrot and place in a bowl in which you want to serve the vegetables. Clean the shrim from the tail if there is one and wash and dry them. Cut the burger buns in half and toast the inside. Heat up a small pan to medium-high heat. Clean and cut the onion into tiny squares. Once the pan is hot, add the oil and the onions. Reduce to medium heat. Fry them until they start to get a little colour. Mix the mayonnaise, the ketchup and the seasoning in a bowl big enought to add the shrimp later on. Overseaon it a little as we won't season the shrimp. As the shrimp are already cooked we only need to reheat them and give them a good sear. Add them to the pan for 2 minutes. Set aside and let it cool down a little bit. Now you can put the steamed vegetables to the carrots, as salt and pepper and the 30g of cream cheese and mix it. Add the shrimp to the sauce and mix it thourougly. Spread the remaining cream cheese on the bottom of the burger bun, place the arugula evenly on it. Now you can place the srhimp mixture on top of that and close is up with the top part of the bun. Serve on a nice plate together with the vegetables. 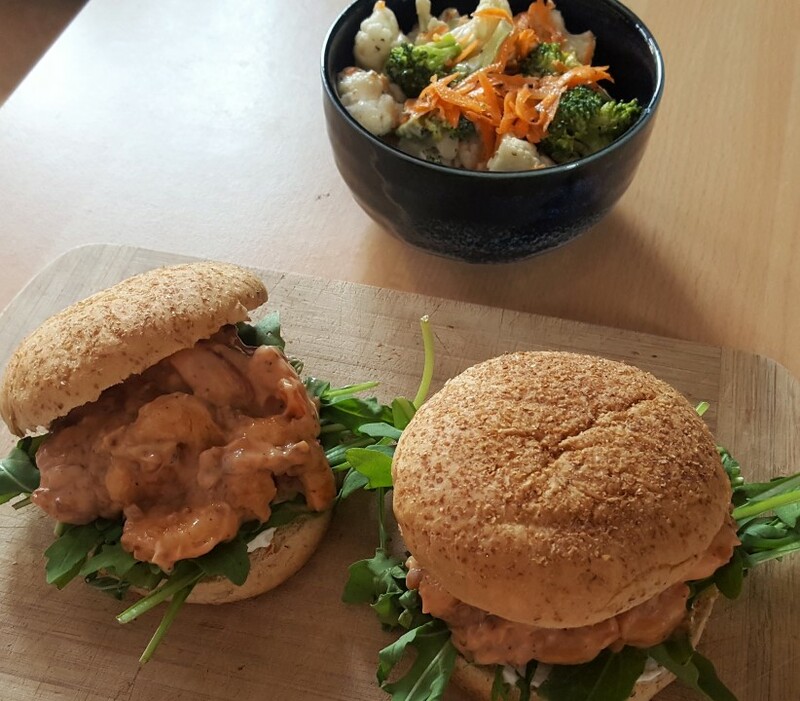 This entry was posted in Cooking, Low Carb Diet, Recipe, Sport & Fitness and tagged burger, hambuger, low carb, recipe, shrimp, spicy, vegetables by Stefan. Bookmark the permalink.